Ashley Tisdale & Her Mom Grab Breakfast At Kings Road Cafe! Ashley Tisdale and her mom Lisa were spotted having a mother daughter breakfast at Kings Road Cafe in Studio City, California yesterday morning. The duo enjoyed catching up and grabbing a bite to eat to start their day. Check out some candids of Ashley and Lisa below! What is your favorite thing to do to spend time with you mom? Joe Jonas + Blanda Eggenschwiler Can’t Stop Smiling At Kings Road Cafe In LA — See The Cute Pics! Once Joe Jonas parked his Mercedes-Benz G-Wagen and paid the meter, he and girlfriend Blanda Eggenschwiler brightened up the day a little more with their big smiles before and after their (no doubt) delicious meal at Kings Road Cafe in Los Angeles, California on Tuesday (March 25)! While those grins were definitely their best accessories, the cute couple was looking fashionable, as usual — Joe in a gray-green hooded jacket, black jeans, and fresh white Lacoste sneakers, while Blanda wore a denim jacket over a sheer black top, dark wash skinny jeans, black ankle boots, and the Obey “Pearse” beanie (available here). Check out all the pics of their lunch date in the gallery below now. We love seeing these two so happy, how about you? Joe Jonas Makes Sweatpants Look Good While Leaving Kings Road Cafe — See His Laid-Back Breakfast Look! 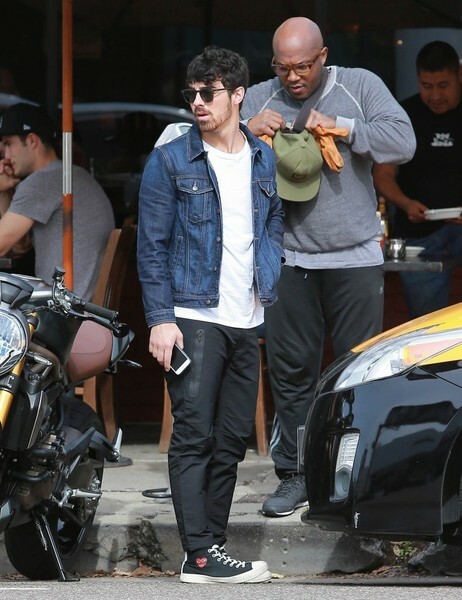 Joe Jonas was looking laid-back and comfy cozy after hitting up the Kings Road Cafe in Los Angeles, CA on Friday morning (February 21) for a delicious breakfast! Dressed in a dark hoodie, tee, and black Nike sweatpants and sneakers, the 24 year-old performer chatted away on the phone as he made his way back to his Mercedes-Benz G-Wagen. We bet he was ready to hit the gym again after digesting his meal — what do you think?